The London Borough of Southwark is located in South East London. They manage Nunhead Cemetery, Camberwell Old Cemetery and Camberwell New Cemetery and Honor Oak Crematorium. Servicing a large area of South East London running down from the river Thames to South Dulwich. Covering Borough, Bermondsey, Rotherhithe, Walworth, Peckham, Camberwell, Peckham Rye, Nunhead, Honor Oak and Dulwich. All of the burial records for all of these sites from the time they opened are available to search on Deceased Online. There are records for 600,000 people. The oldest records dating back to 1840 and most recent record being displayed are currently 2011. You can view and download a scanned copy of the original register entry, find out who else is in the grave, download a map of the cemetery showing the section where the grave is located and a headstone image if we have one. For further details of each site click on the links below. Located between Peckham and Lewisham in South East London, Nunhead Cemetery is one of the capital's most treasured early Victorian cemeteries and within the select group of the 'Magnificent Seven' of historic cemeteries. Consecrated in 1840, the Friends of Nunhead Cemetery describe this special place as "Perhaps the least known, but most attractive" of the Magnificent Seven. It is one of the Magnificent Seven cemeteries, three of which are available on Deceased Online with all burial records, the others being Brompton Cemetery and Kensal Green Cemetery, both in South West London. Managed by the London Borough of Southwark, their website states: "Nunhead Cemetery's history, architecture and stunning views make it a fascinating and beautiful place to visit. While much of the cemetery is mysterious and overgrown, many of its features have recently been restored to their former glory." It has grandiose monuments of the most important and well respected people of the day sitting alongside smaller headstones, which mark some of the common or public graves. Whilst much of the cemetery is designated a nature reserve and is largely overgrown, many of its features have and are being restored to their former glory by Southwark Council and the Friends of Nunhead Cemetery. The Nature reserve and wooded areas have managed paths but safe access to all parts of the cemetery is no longer possible. Please do not attempt to enter woodland areas due to the danger from unstable monuments, uneven ground, unsafe trees and thick undergrowth. The first burial was of Charles Abbott, a 101 year old Ipswich grocer; with the first grave dug in October 1840. It was reopened in May 2001 after an extensive restoration project funded by Southwark Council and the Heritage Lottery Fund. Fifty memorials were restored along with the beautiful Anglican Chapel, designed by Thomas Little. Most of the 52 acre cemetery is closed to new burials but some burials do still take place. There are nearly 300,000 burials in around 46,000 graves, records for all of which are available on Deceased Online. There are many memorials and a number of notable burials as well as 580 war graves from both World Wars including many for service personnel from Canada, South Africa, Australia and New Zealand. All Nunhead records are available from opening in 1840 through to 2011 and comprise: Scans of original registers (a combination of burial registers and index registers) Computerised register records for newer recordsGrave details indicating all those buried within each grave maps indicating the square in the cemetery where the graves are located with the vital square number and grave number. Some of the registers feature handwriting that is not very easy to read. Looking at them with the 'basic viewer' will enable the user to enlarge but using the more advanced 'Java' version (easy to download) enables greater magnification and print contrast, which makes the text easier to read. Covering all burials since opening in 1927 there are a total of 200,000 records covering the burials of 80,000 people. Available are register scans, listings of other interments in the grave and maps showing where the grave is located in the cemetery. There are a number of unmarked public graves in the cemetery with a lovely memorial erected to them by the rose walk. 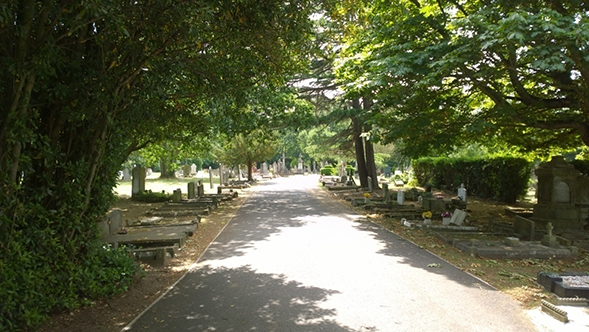 The cemetery is well kept and can be accessed through the magnificent main gates off Brenchley Gardens or on foot from the bottom corner just up the hill from Honor Oak Park station. Covering all the burials from opening in 1856 there are a total of 550,000 records covering the burials of 220,000 people. Available are register scans, listings of other interments in the grave and maps showing where the grave is located in the cemetery. There are large numbers of unmarked public graves in the cemetery. The top half of the cemetery is mown and the bottom half is a nature reserve. There are many notable burials and magnificent memorials. 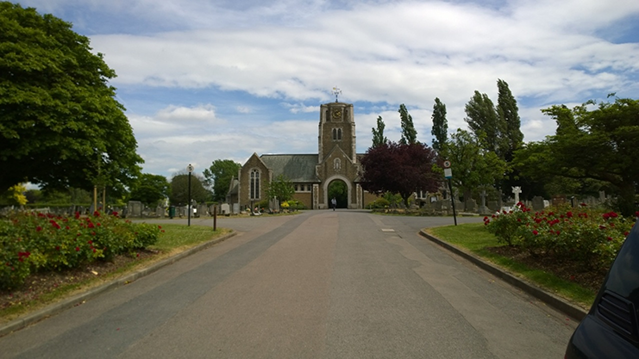 Honor Oak Crematorium is located next to Camberwell New Cemetery and is one of the busiest crematoria in London. Many of the older records feature excellent detail including full names, addresses of both the deceased and the applicant (who may be a spouse or other relative, friend or associated), age, marital status and even occupations. Note: Records from the start of 2001 are masked over the name and address of applicant and signatory.